55'-33' Articulated self leveling tow able trailer boom with 4' x 2' 6" 500lb platform. Hydraulic outriggers and automatic leveling allow operating in under 30 seconds. 2" trailer hitch Can be towed by a 1/2 ton pu truck properly rated. Air & water lines plus 110v are plumbed to protected outlets to platform. Working height 61'3" , Platform Height 55'3", reach from center 33'5"
reach from footpad 27'4" Up and over height 23' 1"
Stowed length 22'11", Width 5' 7", Height 6' 6"
Gradeabilty & Leveling Capability 12% or degree of slope. 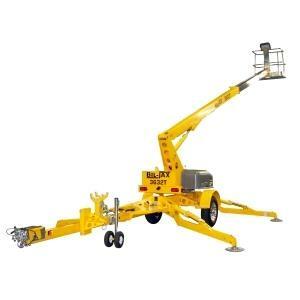 * Please call us for any questions on our boom lift 55 foot 33 articulated trailer mt rentals in Portland OR, Gresham OR, Milwaukee OR, and surrounding metro area.